Successfully Added Car GPS Navigation System and Multimedia Player with Bluetooth to your Shopping Cart. Car GPS navigation system and multimedia player with Bluetooth. With the traffic these days it seems like all of us are spending a longer and longer amount of time in our car. Why settle for a boring commute listening to old tapes or hours of commercial filled AM radio when you can have some real entertainment that leaves you charged full of energy when you reach your destination? This Car GPS Navigation System will not only help you get to your destination quickly and safely, but it will get you there while providing entertainment for you and your passengers. This 1-DIN (50mm tall) car multi media player has a 5.0 inch detachable touchscreen faceplate, Bluetooth for handsfree calling functions, plays CD's and DVD's, and runs all of today's popular GPS software**. This is great D.I.Y. upgrade to any vehicle. If you're in the mood for some car audio / video or the kids just need some entertainment, the CVSA-C10 has enough entertainment features to keep everyone happy. Driving is so much more enjoyable when you know where you are going (GPS) and can enjoy the ride to your destination. This model is certain to be a hit with your customers or as a gift to yourself. 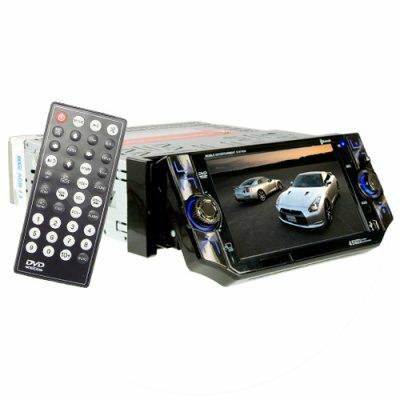 Whether you are in the resale market, VAR and OEM market, or just need a personal/company use system, this is another amazing car GPS + DVD/CD system brought direct to you at the usual low Chinavasion wholesale price. Standard single DIN size, 50mm tall. Native GPS navigation system for running all of today's popular GPS software**. Entertainment, navigation, and communication solution in one unit. - Languages: English, Traditional Chinese, Simplified Chinese, German, French, Spanish, Dutch, Hungarian, Czech, Danish, Norwegian, Swedish, Portuguese, Italian, Finnish, Romanian, Russian, Polish. Note: Actual GPS voice and display languages depends on the GPS software maps you choose to use. **This model is compatible with most brands of GPS software - however hardware specific software such as Garmin may not run on this unit. As the wholesaler, Chinavasion provides the GPS-enabled hardware only, not the software. Chinavasion provides no warranty or customer support regarding GPS software. Chinavasion cannot provide downloads / links / advice regarding GPS software. Any software installation you undertake should be performed or supervised by a professional. Does this unit work in my home language of ___________ (Spanish, French, German, Portuguese, ... )? The display and voice languages the GPS unit uses for navigation and map display depends on the GPS maps being used. Most map software comes with a wide selection of language choices, which means both the display and sound (voice) will be in your preferred language. However, you should carefully select and buy the map software that is best suited for your region of the world. Does this unit come with antenna's? This unit comes with a magnetic base GPS antenna. For the analog TV function and AM/FM radio you can use your cars own antenna or buy a separated antenna (an antenna signal splitter may be needed to feed both the TV and Radio antenna inputs). Why would I want to get this instead of a portable GPS unit? An installed car GPS navigator gives you a distinct advantage over the cheaper portable units on the market - having a dedicated 3-meter long magnetic base GPS antenna which you can locate anywhere on your car, you maximize the GPS signal gain, meaning you will get a constant feed of data that would have been missed on portable units. Knowing you can just get into your car and start driving makes life just that much easier.